There are lots of ornaments, artificial plants, gravels, backgrounds and other accessories one can decorate their aquarium with. The tank will surely look nice to the eye, but would you prefer staying in a room full of live or artificial plants? When you decorate your aquarium, you shouldn't forget about the enormous role live plants play besides their decorative purpose. Live plants provide a more natural habitat for fish and other benefits that cannot be duplicated by artificial plants. These benefits are listed below. • Giving natural shelter and security to baby fish, shy fish, weak fish and females giving birth. Artificial plants can never compare with live plants in bringing out the natural behaviour and beauty in the fish. • Serving as food for herbivore fish. However, almost all fishes will consume plant matter if they're given the opportunity. • Live plants harbour bacteria that help decompose ammonia and other wastes, preventing green water. With just a small amount of live plant material floating and breaking the waters surface, you can get rid of most algae and a whole lot of other aquarium maintenance. This is simple and inexpensive. 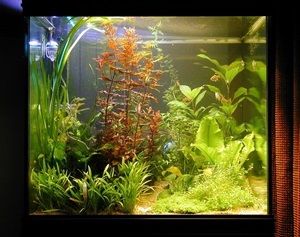 A well-maintained planted aquarium often needs little chemical filtration. • Absorbing carbon dioxide and adding oxygen to the water. Keep in mind, however, that at night this process is reversed. In heavily planted tanks carbon dioxide levels can rise significantly while the oxygen levels drop off. The solution to this would be running an airstone at night. • Live plants increase the surface area for tiny worms, rotifers and protozoa to grow, which are live food for the fish in the tank. • This is a matter of taste, but many people find that live plants look just nicer. If you decide to decorate your aquarium with live plants, please remember they require good lightning. In addition, make sure your live plants carry no harmful pests such as snails and parasites that can cause disease. If your plants start decaying, remove them as quickly as possible to prevent waste that is harmful to the fish.